In this Oct. 28, 2006, file photo, musician Whitney Houston arrives at the 17th Carousel of Hope Ball benefiting the Barbara Davis Center for Childhood Diabetes in Beverly Hills, Calif. Houston died Saturday, Feb. 11, 2012, she was 48. LOS ANGELES — Whitney Houston, a willowy church singer with a towering voice who became a titan of the pop charts in the 1980s and 1990s but then saw much of her success crumble away amid the fumes of addiction and reckless ego, has died. She was 48. Kristen Foster, a publicist, announced Saturday that the singer had died, and police sources later confirmed that she was found unresponsive in her room at the Beverly Hilton Hotel about 3:30 p.m. Paramedics performed CPR on her, but she was pronounced dead about 4 p.m., Beverly Hills Police Lt. Mark Rosen told KTLA News. Officials investigating her death are trying to determine whether she drowned in a bathtub shortly before she was set to attend a pre-Grammy Awards gala. It will be weeks before investigators determine an official cause of death. The Los Angeles County coroner’s office said it performed an autopsy on Sunday but deferred any findings until toxicology results are available in six to eight weeks. Sources who were briefed on the probe said drowning is one of several scenarios investigators are exploring. The sources stressed that authorities still have many unanswered questions, particularly about what Houston was doing in the hours before her death. They also are interviewing friends and family members to determine whether Houston had any underlying medical conditions, said the sources. One source with knowledge of the case said that although Houston was found in the bathtub, officials are still unsure whether she died of natural causes or was in some other way stricken. Houston struggled with drug and alcohol problems for years, and last May her spokeswoman said the singer was going back into rehab. Houston was in Beverly Hills for music industry titan Clive Davis’ annual pre-Grammy party Saturday night at the Beverly Hilton. Over the last few days, she had made several public appearances. At times she had been acting strangely, skipping around a ballroom and reportedly doing handstands near the hotel pool. Houston greeted people with a warm smile but at times appeared disheveled in mismatched clothes and hair that was dripping wet. On Thursday, Houston dropped by the rehearsals for the event, where journalists — including a Times reporter — were in attendance. A Grammy staffer said that as reporters interviewed Davis and singers Brandy and Monica, Houston was dancing just off camera to make the singers and Davis laugh. Grammy personnel expressed concern that she’d be caught on camera, and that reporters would write about her behavior. Beverly Hills police officials, who are investigating the case in conjunction with the coroner’s office, said Saturday night that it’s far too early to determine whether drugs or alcohol played any role in Houston’s death. Police said there is no indication of foul play but placed a security hold on her coroner’s office file, which is common in high-profile cases. Lt. Mark Rosen said Houston was at the hotel with a large entourage of family, friends and co-workers, some of whom helped identify her body after she was declared dead. On Sunday morning, bleary-eyed music star Ray J was seen surrounded by three companions in the hotel’s lobby. Ray J, who reportedly had been dating Houston on and off, was being consoled by others. Later, Ray J left the hotel and was whisked away in the passenger seat of a red Ferrari. A short time later, Houston’s daughter, Bobbi Kristina Brown, was rushed by ambulance from the hotel to nearby Cedars-Sinai Medical Center, police said. Details of her medical problem were not available, but she was reportedly released from the hospital a few hours later. The hotel also was besieged by fans who assembled a makeshift memorial of flowers, candles and notes for Houston. One woman drove onto Santa Monica Boulevard from Wilshire Boulevard, asking a reporter on the corner to add a bouquet to the mix. Another woman snapped a photo with her iPhone on the way to the bus stop. Worshipers at the First AME Church of Los Angeles held a moment of silence in honor of Houston at their 10 a.m. service. Their pastor, John J. Hunter, described Houston as “one of the most dynamic voices of our time,” according to an announcement on the church website. “We are all deeply saddened by her passing and our hearts go out to her family,” he said. In Houston’s hometown of Newark, N.J., an icy wind sliced the air outside the New Hope Baptist Church as Donna Thorn stuffed another bouquet between the iron bars of the church gate. On the surface, Thorn, a short woman in sweatpants and a wool cap, didn’t appear to have much in common with Houston, who as a child sang gospel in the red brick church. Thorn’s eyes filled with tears and her voice shook as she described her own struggle with drugs and the empathy she had for the late pop star, who went through the same thing. “If you was never an addict, you don’t know what it’s like to struggle and stay clean … to hit rock bottom,” said Thorn, recalling her own battle to get off drugs as she grew up on the gritty streets of Newark, where Houston was born 48 years ago. It’s unclear how long the investigation of Houston’s death will take. The coroner’s office took about a month to rule that rapper Heavy D’s unexpected death last year was caused by a blood clot. The star’s professional decline had become a familiar part of her public saga. Her haggard appearance at times shocked fans who had once been drawn to the singer’s world-class smile and approachable glamour in music videos, album covers, concerts and, later, hit films. Songs like “I Will Always Love You” and “Saving All My Love for You” had women around the world singing along with the star, but by the end of the 1990s they barely recognized her. As Houston’s public persona veered into something darker and more volatile, many fans pointed to her relationship with Bobby Brown as the axis on which her life seemed to be spinning so madly. She acknowledged that she was immersed in drugs, and the toll on her voice and her appearance was difficult to watch. In his autobiography, Brown wrote that their marriage “was doomed from the very beginning,” saying that they separated in the first year and several times in the years after. He said he believed she had married him “to clean up her image.” Brown also admitted he was not faithful to Houston. Whitney Elizabeth Houston was born Aug. 9, 1963, in Newark, N.J., and powerful female voices and the sound of choirs were in her ears before she could walk or talk. Cissy Houston, her mother, was a gospel singer and back-up singer who worked with the likes of Otis Redding, Wilson Pickett and Dusty Springfield. Aretha Franklin was the youngster’s godmother, and Dionne Warwick and Dee Dee Warwick were her cousins. There was little doubt that young Whitney would follow their career paths. In her family’s basement — which was Madison Square Garden in her imagination — she would belt out “Respect” and bask in the applause that she might have considered her birthright. By high school she was singing back-up for Chaka Khan and Lou Rawls and had also embarked on a modeling career that put her in the glossy spreads of Seventeen and Glamour magazines. At a showcase in Sweetwaters supper club in Manhattan — she could sing at 19 but wasn’t old enough to buy a drink — she was spotted by Davis, the music mogul who has become legendary for his ear and his success in guiding the early careers of Rod Stewart, Carlos Santana, Barry Manilow, Alicia Keys and Kelly Clarkson. Davis saw in Houston a rare bundle of raw talent, beauty and pedigree. He spent two years and $250,000 to prepare and package her before releasing her 1985 debut album, “Whitney Houston,” which would became a mega-seller. “Whitney Houston” became the first album by a new female artist to yield three No. 1 singles: “Saving All My Love for You,” “How Will I Know” and “The Greatest Love of All.” Critics moaned that the material was too flimsy for a such a prodigious instrument, but Houston reveled in the success. She became a major crossover star and, with her church background and relatively wholesome aura, she was the rare female recording star who was young and attractive but not overtly sexualized on stage and on screen. 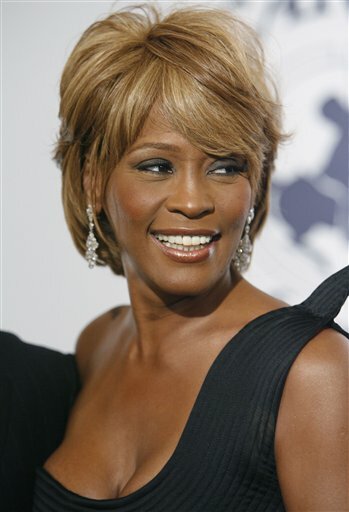 Houston’s follow-up album, “Whitney,” in the summer of 1987, delivered hit after hit with “I Wanna Dance With Somebody (Who Loves Me),” “Didn’t We Almost Have It All,” “So Emotional,” and “Where Do Broken Hearts Go.” For her career, her sales totals would become dizzying: By some accounting, she sold more than 170 million albums, singles and videos in the pre-digital marketplace. Houston’s stirring rendition of “The Star-Spangled Banner” at the 1991 Super Bowl became a signature as well and a massive fundraiser for the American Red Cross. More than sales units, Houston had stepped to the center of pop culture in a way that would make her a powerful influence on several generations of singers, especially Mariah Carey, Christina Aguilera, Alicia Keys, Queen Latifah and Jennifer Hudson. Carey, one of the few female stars of Houston’s era who was on a competitive commercial footing, said Saturday she was reeling from the news. From topping the pop charts, the next frontier was film, and in 1992 Houston starred with Kevin Costner in “The Bodyguard.” The soundtrack won the 1994 Grammy for Album of the Year and also yielded the hit “I Will Always Love You,” which became the best-selling single by a female artist in music history. In 1995’s “Waiting to Exhale,” Houston showed that, like Diana Ross, she aspired to a more complex acting persona. And she had recently finished shooting “Sparkle,” a remake of a 1976 Irene Cara film that focuses on the backbeat of addiction in the music industry. Houston amassed rooms full of trophies through the years, including 22 American Music Awards — more than any other woman — and six Grammys. Any awards show she was on was must-see television, although the reasons for that changed through the years. On Saturday, at Staples Center, rehearsals were under way for the 54th Annual Grammy Awards, and news of Houston’s death arrived as a whispered bombshell while Rihanna was on stage singing “We Found Love.” Producers swapped stunned looks and immediately reached for the phones, scrambling to find the right tone and content for a memorial segment on the show. They decided on a short, austere performance by Jennifer Hudson, one of Houston’s clear contemporary disciples. “It’s too fresh in everyone’s memory to do more at this time, but we would be remiss if we didn’t recognize Whitney’s remarkable contribution to music fans in general, and in particular her close ties with the Grammy telecast and her Grammy wins and nominations over the years,” said Grammy executive producer Ken Ehrlich, a key figure in the Grammys since the early 1980s. LA Times staff writers Richard Winton, Ari Bloomekatz, Garrett Therolf, Larry Gordon, Geoff Boucher and Tina Susman contributed to this report.